It's almost a year since Nokia and Intel announced they would throw Maemo and Moblin into a big mixing bowl to create MeeGo - the open source OS that can run on both x86 and ARM-based processors. While we've seen MeeGo running on devices such as the Nokia N900, we haven't had a play with it on a netbook - until now. Here it's running on an MSI unit. The netbook variation of MeeGo is a continuation of the previous Moblin efforts and the look and feel differs from the "tablet version" of the OS. Obviously this is the netbook version, which is separated into areas, seemingly called zones. Here we have the MyZone area, complete with quick access to apps in the bottom left. You can also see appointments and tasks. There's also a People zone, which would appear to be for instant messaging. Web browsing comes courtesy of the Google Chromium open source code - essentially it looks exactly like Google Chrome.The Applications zone shows you what's installed and gives you access to them. It's all rather good-looking, isn't it? Indeed, MeeGo is what we reckon a netbook-specific OS should look like. The way Windows and OS X have inculcated us, we need some kind of dashboard. 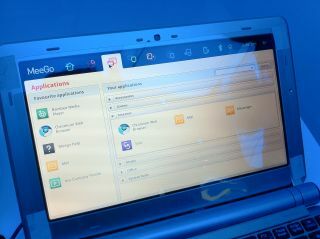 And that's why we like the look of MeeGo on a netbook far more than we do Google Chrome OS. MeeGo just feels a lot more like an operating system than Chrome does. Chrome's lack of anything is just too disconcerting. And, of course, you still get the Chrome browser experience anyway.